It's just so absolutely perfect that on Day 200 (imagine, 200!) of cooking vegetables in a new way every single day, what emerged from the veggie bin is this delicious, easy, nutritious side dish. We can never, ever get enough broccoli! It's every day food. It's wonderful. Bring an inch of water to boil in a steaming pan. Transfer broccoli to steamer basket. When the water is boiling, place the basket inside the pan, COVER and let steam for five minutes. Turn the heat off, leave the cover on and let rest for five minutes to finish cooking. Meanwhile, assemble the sauce ingredients in a small pan and bring to a boil. 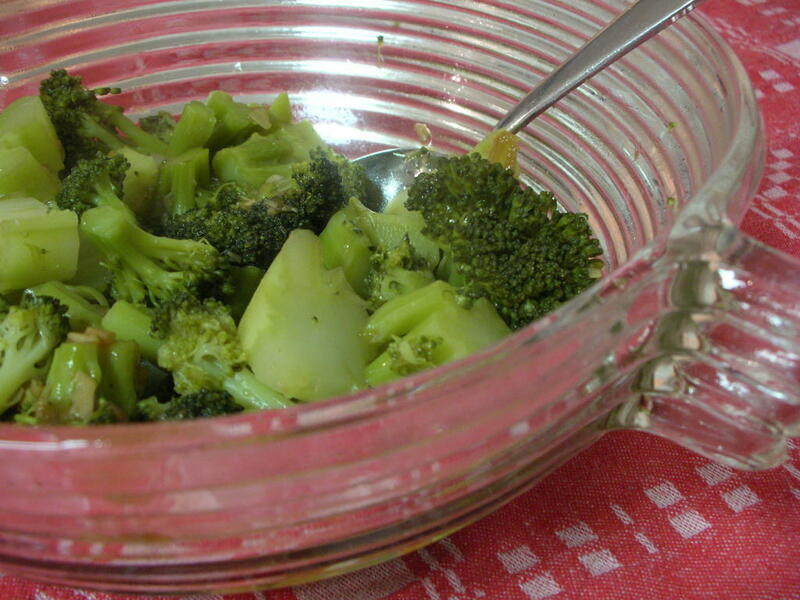 Toss with the broccoli and serve. How to agressively trim the broccoli (instructions come from StephenCooks). Hi Alanna - I loved this recipe and just posted it on my blog, giving you full credit of course. It was truly delicious!